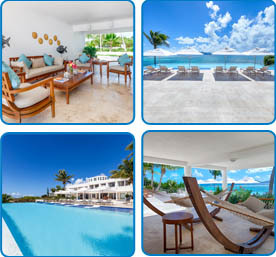 Villa Paradise is an exquisite 7,000 square foot, gated vacation home surrounded by 3.5 acres of magnificently landscaped gardens overlooking the sea- the home is one of the most luxurious villas in the Caribbean as well as one of the most beautiful luxury homes on Anguilla…a preferred hideaway for celebrities and royalty / the rich and famous / the less known but well-travelled. 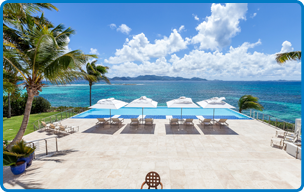 Villa Paradise combines natural beauty with quiet elegance while offering unrivaled views across the crystalline Caribbean Sea to the majestic mountains of St. Maarten, making it one of the most sought-after luxury villa rentals in Anguilla. The villa's protected harbor with boat dock and small, private cove are located in front of the villa while the adjacent coral reef offers some of the best snorkeling opportunities in Anguilla. Villa Paradise was updated and renovated in 2015. 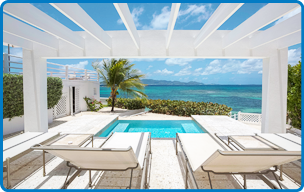 A significant part of the renovations includes a gracious 28’ x 69’ infinity edge pool spilling over to the Caribbean Sea and luxurious hot tub surrounded by an ivory stone deck with remarkable views. In addition, there are shaded outdoor areas featuring double hammocks…all in all, a marvelous opportunity for personal use with impressive rental options. 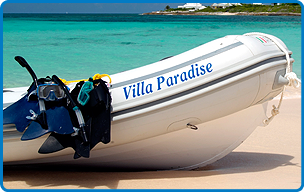 For more ideas to help you enjoy your stay at our luxury villa in Anguilla, see our complete list of things to do around Villa Paradise. 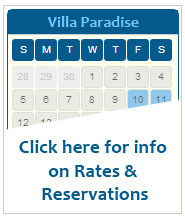 Or make a reservation and see for yourself what makes Villa Paradise the best luxury Caribbean villa rental around.